My son has weird hands. No one can figure out exactly why but every winter the skin gets very dry (only the backs) and actually start to crack and bleed! It's been happening for about 7 years now. It finally occurred to me to make him an herbal salve from Calendula and his hands have been healing up quite nicely! Calendula (Calendula officinalis) has marvelous skin healing properties and I've had him soak his hands in cooled Calendula tea which has helped soothe it a bit, but never quite healed completely. This happens every winter and it lasts until spring, then it miraculously goes away. Weird I tell you! About the only lotion that worked without burning was that Working Hands stuff from the store, but it's loaded with chemicals. I finally decided that since the tea helped a little, I needed to find a way to keep the Calendula on his hands and I would have to make him a salve. I love using the herbs I grow to make things! I had already made Calendula oil from flowers this summer so I just had to come up with a way to use it on his skin. I decided to add beeswax to thicken it and coconut oil as a moisturizer, plus a dash of Tea Tree essential oil since it has such great healing properties. This recipe doesn't make a very big batch, but it's enough to last all winter. I don't tend to use big batch recipes though, because I like to make this as I need it so it's always fresh. 2 small clean jars. I used the small Ball jelly jars because they're easy to reach the bottom of without needing a spoon. 1/2 ounce beeswax, chopped up. I buy these bars and just cut 1 in half, but many people like to use the beeswax pastilles. 1/4 cup infused Calendula oil. here's my tutorial. 2 drops Tea Tree essential oil per jar. To start, make sure the jars are clean and dry. Put both oils and the beeswax into a heat proof container. Using the double boiler method, heat until melted stirring often. Pour into jars. Add the tea tree oil and stir to incorporate the oils throughout. Let cool and cap tightly. Store in a cool place out of sunlight. 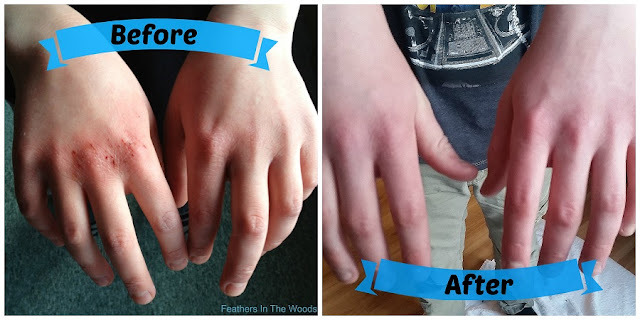 My son used it on his hands twice a day for a few days and wow, what an amazing result! The cuts healed up and the redness went away. It was that simple. When you think about it, most of the things we buy are so leaden with chemicals that they often do more harm then good. Take this dry skin for instance. When skin is dry and irritated, many chemicals just make it worse. Which in this case causes cracking and bleeding and pain. Most of the heavy store bought creams we tried burned when he put them on because of the cracks. So it just kept getting worse! By going back to the basics and making my own product, I'm just using the good stuff and leaving the chemicals behind. (now here's a bit of a disclaimer) However, because of the lack of chemical preservatives this will not keep indefinitely like the store bought moisturizers. This is why I make a small batch recipe, so it doesn't go bad before I use it all. Do not use a homemade product if it starts to change in consistency or smell bad. You can store these tightly capped in the fridge. Though it will last longer, it will harden when cold. I bet that would feel good on sunburn though! Looks like I may have a new use for it. I'll let you know after I try it. 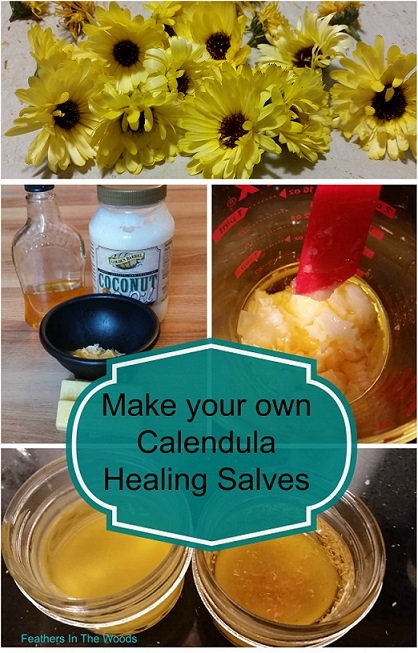 If you don't happen to have calendula oil already made, you can use the same method I use for my burn salve recipe. Just follow that method for heating up the flower petals and oil, then once strained use this recipe! In the meantime: I am not a Dr nor do I play one on TV. 😉 This is not medical advice just my own recipe created by using basic proportions and substituting or adding in the ingredients I desired. It works very well for us. Let me know if you try it! I must try this. My hands do the same thing in the winter...I use Vaseline (especially at night). Give it a try, I think you'll like it! My hands used to do that when I lived up north in Kentucky. The winters were so dry and cold! It doesn't happen much or at all here in NC now, but I've got the seeds to grow calendula for the first time and I'm going to try to build up an herbal "medicine" stash. I'll have to try this recipe, the lotion sounds awesome. I wonder if it would help with exzema? You know, Chamomile is really good for eczema. I'm sure you could add some chamomile to it and make it even better for eczema. Give it a try, it should work well! Wow! This is wonderful! Thank you for sharing with us at VMG206 Brag About It. First, how weird that the insides of his hands aren't dry!! My knuckles do that sometimes in the Winter, too. This homemade remedy sounds awesome, although I don't have any calendula. It looks like it helped your son a lot!! Thanks for sharing. Can't wait try adding this to my comfrey salve. Looks very healing and soothing. Thanks for sharing. Calendula is a great treatment for sore skin since it is very gentle. E-vitamin is often used as a preservant in natural beauty products if you want to try. I always store my products in the fridge except for the ones I currently use. I think your recipe is a great hand creme for everyone to use. I shared it. Thank you for sharing your recipe!